Situated only 40 minutes away from Marrakech on the road to Amzimiz, neighboring the lake of Takerkoust, at the foothills of the High Atlas mountains, the location of the venue offers a superb panoramic view on the neighboring Berber villages and the snowy Atlas peaks. Proximity to the mountains and the Berber villages offer the possibility to organize different outings: pedestrian/equestrian excursions or trekking, mountain bikes, camel/donkey/mule rides, 4x4, paragliding, skiing in Oukaimeden. The tracks are accessible to everyone with various difficulty levels, and can be programmed by hour, ½ a day, a whole day or several days. Away from the noise of the crowd and the pollution of the city, you can leave behind the bustling routine and open your hearts to new feelings and sensations. The atmosphere at “Couleurs Berberes” brings the people together thus being a perfect place for seminars, meetings, conferences, incentives and other events. 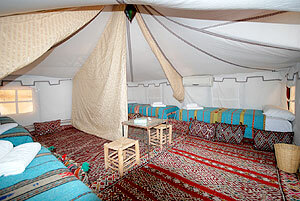 The tents form a circular camp, sign of union, surrounding a lush garden of roses and rosemary. In the center of the circle is the campfire place. Follow the paved walkways to get to your tent: numbers of the tents are marked at the beginning of each path: practical, clean and accessible for a better accessibility and travel with wheeled luggage. 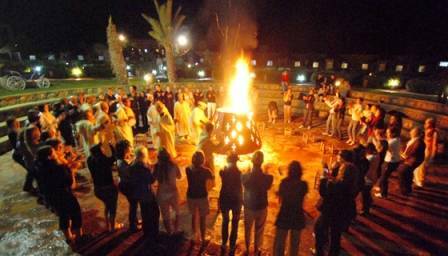 Each room is provided with comfortable bedding: 190/90 cm mattress, wooden bed frame, organic cotton towels (small and large sizes) and bed sheets, Berber handmade blankets and carpets, a small traditional mosaic night stand and a lantern with an electric bulb and 2 electric plugs. The tents offer 20m² of space, they are all fixed, secure and waterproof, equipped with air conditioning/heating, with a decorative cotton fabric covering the inside and a frame of iron consolidating the template of the tent. The tent frame is buried in a slab, providing insurance and immobility. On the exterior of the frame it is covered with an authentic Bedouin cloth made of goat wool fiber, which makes them hermetic. 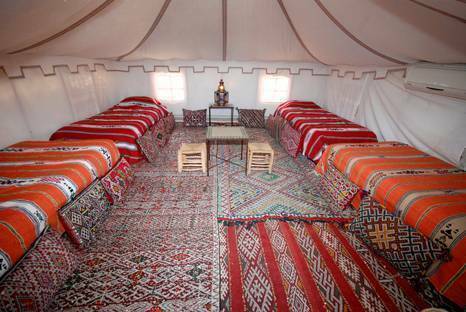 Each tent is provided with comfortable bedding: 190/90 cm mattress, wooden bed frame, organic cotton towels (small and large sizes) and bed sheets, Berber handmade blankets and carpets, a small traditional mosaic night stand and a lantern with an electric bulb and 2 electric plugs. This is to avoid long queues at the WC in the morning/evening. You are lodged in traditional nomadic Berber tents (its original name is Haima: a kind of a portable house used by the nomads to move from one place to another in the desert) 20m² of space, fixed, secure, waterproof and equipped with air conditioning/heating, with a decorative cotton fabric covering the inside and a frame of iron consolidating the template of the tent. The tent frame is buried in a slab, providing insurance and immobility. 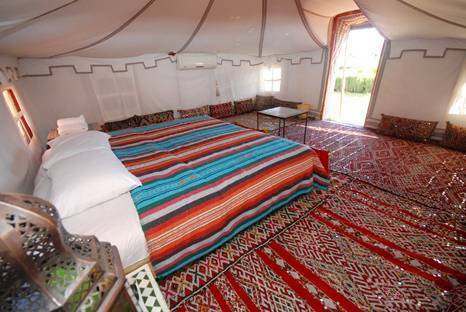 The tents form a circular camp, sign of union, surrounding a lush garden of roses and rosemary. In the center of the circle is the campfire place. Follow the paved walkways to get to your tent: numbers of the tents are marked at the beginning of each path: practical, clean and accessible for a better accessibility and travel with wheeled luggage. Each room is provided with comfortable bedding: 190/90 cm mattress, wooden bed frame, organic cotton towels (small and large sizes) and bed sheets, Berber handmade blankets and carpets, a small traditional mosaic night stand and a lantern with an electric bulb and 2 electric plugs. “Couleurs Berbères” is equipped with 4 sanitary blocks, surrounding the circle of the tents with WC, showers (cold and hot water), sinks and a dressing room. There are towels and soap available in the toilets. The whole area is illuminated by electric lanterns at night; the lights turn on automatically with a movement detector. Couleurs Berberes is located only 40 minutes away from Marrakech on the road to Amzimiz, neighboring the lake of Takerkoust, at the foothills of the High Atlas mountains: a leisure and tourism venue of 7 hectares, an original site in an authentic and exceptional environment away from stress and pollution. Its unique location offers a superb panoramic view on the neighboring Berber villages and the snowy Atlas peaks. BERBER VILLAGES 0, 5 KM. Follow the adobe wall till you reach the door at the end. May you have any difficulties reaching us, please do not hesitate to call us. We organize trasnfers from Marrakech to "Couleurs Berberes" on demand.